As a parent, we often buy toys sometimes because we had one, wanted one, or just want one. We also buy some toys for our kids thinking it's cool, cute, or that our child is sure to enjoy it. Some, on the other hand, buy the most expensive they can find, or the most educational they can see. Few really care about the age guideline usually stamped on the box. I know I seldom did. It was just a minor consideration, if at all. But the longer I become a Mom, the more I also realie that such age guidelines do serve a purpose. First, there is of course the safety issue. Toys with small parts will not be appropriate for kids three years and below as it may pose a choking hazard, as toddlers are still far too curious to follow reminders. Toys with sharp or hard edges are also not really appropriate for infants yet. Then there is the kind of play the toy was made for. Stacking cups or blocks are okay for a vast age range but say, electronic toys are likely to just be banged and thrown by kids two years and below. Before they can really appreciate what each button is for, the toy is already banged up so much that it's broken. Then there are miniature toys that will be fragile for pre-schoolers who still don't have much self-control. But the most important thing is this: toys are meant for play that's meant for the child to have fun and learn. So the toys you should buy should be age-appropriate for your child to actually manage it and be succesful playing with it. 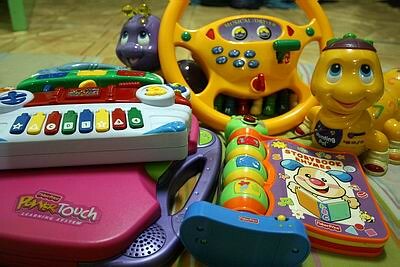 As much as visual,electronic toys entertain, they also limit a child's imagination if given too early. Toddlers and pre-schoolers need more of toys they can mix and match, and throw and taste and build from. So, next time you're about to make an impulsive buy, mind the age guideline and really think: what do I want this toy to accomplish for my child?